Kim Kideckel is Heather Michelle Brock's life-partner. This is her family line. ZEEV WOLF "WILFRED" KIDECKEL was born about 1850 in Disna, Poland. He married LAVA FEIGA. Many of the Jews in Disna made their living from the wholesale trade of agricultural products. After WWI Disna was cut off from its markets in Russia (U.S.S.R.), the economy deteriorated, and the number of Jews in the town declined. This could have been the reason for many to move to Canada and other countries. During this same time period there were pogroms, a form of violent riot, a mob attack directed against a particular group, whether ethnic, religious, or other, and characterized by killings and destruction of their homes and properties, businesses, and religious centres. In 1919, pogroms were reported in several cities in Poland against the Jews. ii. ISRAEL RUEVEN KIDECKEL born 1876 and died 1953. Married MINNIE GLASSMAN. iii. ELIZIEZER LAZER LOUIS KIDECKEL born in Disna. Poland in April 1886. ISRAEL RUEVEN KIDECKEL (WILFRED), born 1876 and died 1953. Married MINNIE GLASSMAN, born 1884 and died 1947.
i. ALEX KIDECKEL, born 1903 and died 1972. Married ESTER VELLIS, born 1908 and died 1968.
ii. ANNIE KIDECKEL, born 1904 and died 1985. Married HYMMIE LUDWIG. iii. LOUIS KIDECKEL, born 1907 and died 1977. Married RAE, born 1914 and died 1978.
iv. REBECCA KIDECKEL, born 1906 and died 1995. Married MAX MORIENS, born 1910 and died 1971.
v. HARRY KIDECKEL, born in 1910 and died 1999. Married (1) SARAH COURMAN, died 1982. Married (2) KATTIE LERNER, died 1996.
vi. FANNIE KIDECKEL, born August 8, 1912 in Krugerdorf, Timiskaming, Ontario and died 1998.
vii. WILFRED KIDECKEL, born in 1917. Married MILDRED KANOWITCH, born 1922.
viii. GORDON KIDECKEL, born 1926 sand died April 17, 1998 in Toronto, Canada. Married SARAH WEINSTOCK, born in 1926.
ix. SAM KIDECKEL, born in 1928. Married ROSE SHERMAN, born in 1923. ELIZIEZER LAZER "LOUIS" KIDECKEL (WILFRED) born in Disna, Poland in April 1886. He married MINNIE MOSKAVITCH who was born about 1886. He died January 9, 1962 in Detroit, Michigan. Immigrated with his wife and children from Ontario, Canada to the USA on 18 Oct 1924 at Niagara Falls, New York and settled in Detroit, Michigan. 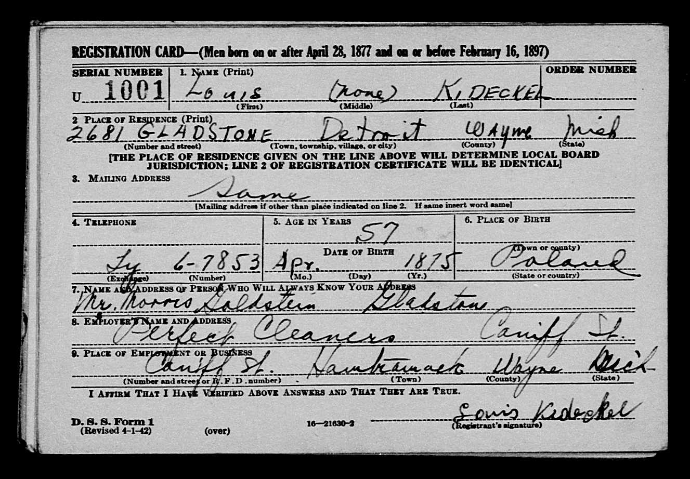 In 1942 LOUIS registered for the draft for WW II registration card. i. BENNY KIDECKEL, born April 6, 1916 in Toronto, Ontario, Canada, died December 31, 2000 in Michigan. ALEX KIDECKEL (ISRAEL, WILFRED), born 1903 and died 1972. Married ESTER VELLIS February 17, 1929. She was born 1908 and died 1968.
i. DOROTHY KIDECKEL married WILFRED KAMINSKY. ii. MURRAY HARRY KIDECKEL married (1) SELMA FINGER, born 1933 and died 1999. Married (2) MARILYN WEBER. ANNIE KIDECKEL (ISRAEL, WILFRED), born 1904 and died 1985. Married HYMMIE LUDWIG. i. ROSE LUDWIG married MOE CRAVITZ. ii. GOLDIE LUDWIG married MARCUS EMMANUEL WEINSTEIN. iii. NELSON LUDWIG married MIRIAM GERTRUDE ARBUS. iv. ALICE LUDWIG married JACK SHAPIRO. LOUIS KIDECKEL (ISRAEL, WILFRED), born September 10, 1907 and died August 1977 in Bronx, New York. Married RAE, born September 28, 1914 and died May1978 in Bronx, New York. i. ARNOLD KIDECKEL married SUSAN GOLDSMITH. ii. BERNARD KIDECKEL married SANDRA SUSAN WEISS, born 1943 and died 1990. REBECCA KIDECKEL (ISRAEL, WILFRED), born 1906 and died 1995. Married MAX MORIENS, born 1910 and died 1971. HARRY KIDECKEL (ISRAEL, WILFRED), born in 1910 and died 1999. Married (1) SARAH COURMAN, died 1982. Married (2) KATTIE LERNER, died 1996.
i. MARSHA JUDITH KIDECKEL married JACK POZIN. ii. IRVING RUBEN KIDECKEL married DARA HEIFETZ. WILFRED KIDECKEL (ISRAEL, WILFRED), born in 1917. Married MILDRED KANOWITCH, born 1922.
i. LANA MAE KIDECKEL married DAVID HERBERT MARCUS. ii. EARL STANLEY KIDECKEL married LISA. GORDON KIDECKEL (ISRAEL, WILFRED), born 1926 sand died 1998. Married SARAH WEINSTOCK, born in 1926. "Mr. and Mrs. Joseph Kessler, and Louis Kideckel, of the Bronx, N.Y.; and Mrs. S. Schreiber, of Detroit, Michigan, were here for the marriage of Miss Sarah Weinstock, daughter of Mr. and Mrs. Max Weinstock, 424 Markham Street, to Gordon Kideckel, son of the late Mr. and Mrs. I. Kideckel." i. IAN ROBERT KIDECKEL married OREET PORTNEY. ii. ALVIN IRWIN KIDECKEL married (1) CHERYL OBRONT and married (2) GAYLE DROPKIN. iii. MARSHALL JEFFERY KIDECKEL married CARLA PILTZ. iv. HEATHER FERN KIDECKEL married STANLEY MINCER. BIRTHS: "Born, to Mr. and Mrs. Gordon Kideckel (nee Sarah Weinstock), 18 Glen Morris Street, on April 2, at New Mount Sinai Hospital, a son, Ian Robert; grandson of Mr. and Mrs. M. Weinstock, 43 Barclay Avenue; and the late Mr. and Mrs. I. Kideckel." Kideckel, Sarah (Weinstock) On June 8, 2008, after a long battle, with all of her courage and strength, Sarah passed to join her beloved husband and soul mate, the late Gordon Kideckel. She will be deeply missed by her children Ian and Oreet, Alan and Gayle, Marshall and Carla, and Heather and Stanley Mincer. She was a warm and loving Boobie and will be deeply missed by her grandchildren Brandon, Daniel, Mitchell, Lauren, Tamar, Cortney, Blair, Benjamin, Jordana, and Gillian. Sarah is survived by her sister Ruth Zalkin, predeceased by brothers Joe and Louis, and sister Molly. Extended thanks to her many caregivers, including Ceily. A funeral service will be held on Wednesday, June 11 at Steeles Memorial Chapel, 350 Steeles Ave. West (between Yonge and Bathurst) at 11:00 a.m. Interment at Bathurst Lawn Memorial Park, Beth Emeth Section. Shiva will be observed at 35 Westgate Blvd., Toronto from 3 p.m. daily. Prayers at 7:30 a.m. and 8:45 p.m. In lieu of shiva gifts, memorial donations may be made to the Baycrest Foundation 416-785-2875. HARRY ABRAHAM KIDECKEL (LOUIS, WILFRED) was born January 14, 1910 in Krugerdorf, Ontario, Canada. He married IRENE MANDELL. He died December 26, 1958 in Detroit, Michigan. i. BARRY DANIEL KIDECKEL married PATRICIA LYNN WELTMAN, daughter of NATHAN WELTMAN and GLADYS MAGILVY. BARRY DANIEL KIDECKEL (HARRY, LOUIS, WILFRED) married PATRICIA LYNN WELTMAN, daughter of NATHAN WELTMAN and GLADYS MAGILVY.